This post contains links to products that I may receive compensation from at no additional cost to you. To view my Affiliate Disclosure page, please click here. 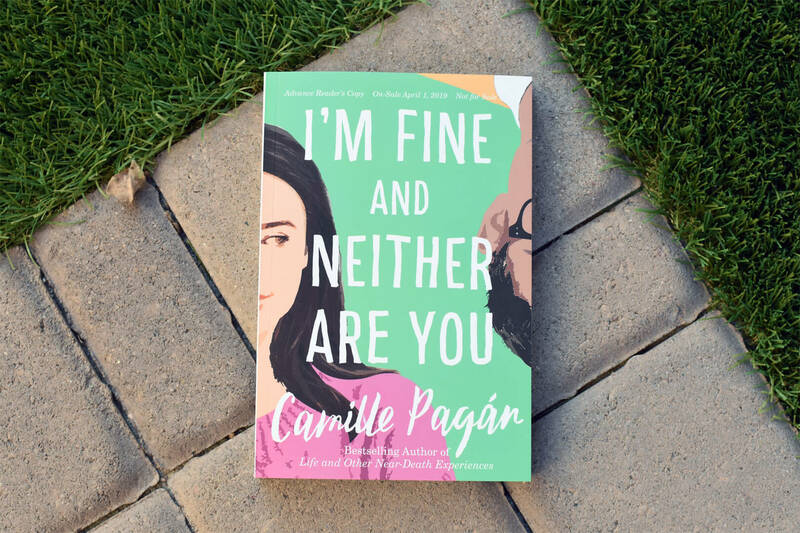 I’m Fine and Neither Are You by Camille Pagán is a look at the challenges for modern women. The following book club questions will have spoilers so if you haven’t read the novel yet, check out my review first. The story follows Penelope—a wife, mother and the breadwinner of her house. While she proclaims she’s “fine,” in reality; she’s barely holding it together. She’s able to vent her frustrations to her best friend Jenny, even though it seems Jenny is sailing through life. As close as the two women are, Jenny’s passionate marriage, pristine house, and ultra-polite child stand in stark contrast to Penelope’s underemployed husband, Sanjay, their unruly brood and the daily grind she calls a career. Then a shocking tragedy reveals that Jenny’s life is far from perfect. Reeling, Penelope vows to stop keeping the peace and finally deal with the issues in her relationship. So she and Sanjay agree to a radical proposal: both will write a list of changes they want each other to make—then commit to complete and total honesty. But both quickly wonder if honesty is the best policy? Penelope at the beginning of the novel is unhappy. She allows herself to admit that there are times she wants out. When do you think she started to get so tired and resentful of her situation? Do you think Sanjay should have recognized it before she brought it up to him? Let’s talk about Jenny and Penelope’s friendship. Why do you think Jenny hid her addiction—was she embarrassed, trying to keep up her image, etc.? Were you surprised when she passed away? How did Jenny’s passing impact Penelope? Let’s talk about the decision for Penelope and Sanjay to write lists about the changes they want in each other. Do you think that was a good idea? Why or why not? Would you do something like that with your spouse? In a sense, the novel deals with identity. For Penelope and Sanjay, life in their ’20s in NYC is quite different from their upper 30s in the midwest. Was this an early mid-life crisis or something else? How is your situation different from 10 years ago? What does the title mean in the context of the book? Let’s now the discuss the issue of saying “I’m fine,” when the opposite is true. When did that harm Penelope and set her back? Do you find yourself saying you’re fine when you’re not? Why do you think we, as a society, always try to pretend everything is ok? When Penelope starts to get very honest with her husband, at work and to her noisy neighbor—she gets pushback that it’s too much. What’s the line between honesty is the best policy and saying I’m fine when you’re not? Is there truly a balance between those two actions? What would you have done if your were Penelope? Let’s talk a bit about Jenny’s husband, Matt, and Penelope’s dynamic. Why do you think he was so against letting the truth about Jenny’s opioid addiction come out? What was the driving force to change his mind? Toward the end of the novel, Penelope realizes that she went to Jenny first for many of her issues instead of talking to Sanjay. She starts to wonder if that caused an issue with her marriage. For instance, she says, “It was impossible not to wonder if her absence has created a vacuum that Sanjay had wanted to fill long before she was gone.” Let’s discuss this thought process. Do you agree with her? Why or why not? What did you see as some of the key issues of Penelope and Sanjay’s relationship? Do you think they are fixed for the long-haul or will it be an ongoing process? All We Ever Wanted by Emily Giffin is a page-tuner with three distinct characters, all in the setting of an affluent Nashville community. Nina Browning is living the good life after marrying into Nashville’s elite. More recently, her husband made a fortune selling his tech business, and their adored son has been accepted to Princeton. Yet sometimes the middle-class small-town girl in Nina wonders if she’s strayed from the person she once was. Tom Volpe is a single dad working multiple jobs while struggling to raise his headstrong daughter, Lyla. His road has been lonely, long, and hard, but he finally starts to relax after Lyla earns a scholarship to Windsor Academy, Nashville’s most prestigious private school. Amid so much wealth and privilege, Lyla doesn’t always fit in—and her overprotective father doesn’t help—but in most ways, she’s a typical teenaged girl, happy and thriving. Then, one photograph, snapped in a drunken moment at a party, changes everything. As the image spreads like wildfire, the Windsor community is instantly polarized, buzzing with controversy and assigning blame. At the heart of the lies and scandal, Tom, Nina, and Lyla are forced together—all questioning their closest relationships, asking themselves who they really are, and searching for the courage to live a life of true meaning. You can order the book on Amazon here. Find my discussion questions here. I Owe You One by Sophia Kinsella is about a woman finding her inner confidence. The story follows a woman named Fixie who earned her name by always “fixing” problems. After her father passes away, he leaves a home goods store to the family and it’s mainly Fixie and her mother keeping it afloat. Her other two siblings, Nicole and Jake, don’t have much interest in helping out. So, Fixie has grown accustom to not saying no and when a stranger asks her to watch his laptop for a moment, she not only agrees—she ends up saving it from certain disaster. To thank Fixie for her quick thinking, the computer’s owner, Sebastian, an investment manager, scribbles an IOU on a coffee sleeve and attaches his business card. You can order the book on Amazon here. Find my book club questions here. Feel free to discuss I’m Fine and Neither Are You below! I love to read and review various genres with a focus on contemporary fiction, historical fiction with some mysteries/thrillers and also select nonfiction and memoirs. If you'd like me to review your book, contact me! Welcome to Book Club Chat! I'm Heather Caliendo and I absolutely love to read! I hope you enjoy my previews, reviews, and book club questions. If you would like to contact or request a review of a specific book (with book club questions), email heather@bookclubchat.com. 2018 © - Book Club Chat. All Right Reserved.